Missing me was exactly what I'd excepted it to me. A fast paced thriller which was a quick page turner and engaging throughout. 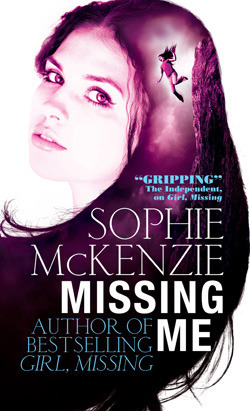 The story focuses on Madison, Lauren from Girl missing and Sister Missing younger sister now aged 15 and follows her story once she finds out her father wasn't her father but actually a sperm donor and decides to go about tracking him down. Sooner rather than later Madison finds herself in the middle of an investigation of a local rich business man who appears to be trafficking young women. I won't go into too much detail about where the story goes on from there on out for fear of spoiling it but be rest assured it unfolds in classic Sophie style with loads of twists and turns thrown in for good measure. For me the best thing about this book was the relationships between Madison and both Lauren her older sister and the boy she meets Called Wolf. I enjoyed seeing how they interacted with each other. A fab, fast paced read which I enjoyed.